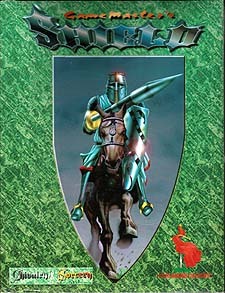 The Game Master's Shield contains all the charts for Chivalry & Sorcery 3rd Edition for easy reference during game play. On the front of the Shield there are tables for Spellcasting and Combat. On the interior of the Shield all the necessary charts are included for Skillskape, as well as damage information for weapons and armour absorbtion values. The Shield also acts as a buffer, or screen, allowing the GM's dice rolls and notes to remain private. Also included is a 16 page booklet with a scenario guide and seven new Magical Devices of Power. The included scenarios will help the Games Master plot adventures and quests. These are outlines that a GM needs only spend a short amount of time fleshing out to create his own unique adventures. The Magical Devices of Power serve as examples of the Chivalry & Sorcery rules for creating magical items, or the GM can use them as is in an existing campaign.